Over recent months the experience of work at the sharp end of Britain’s jobs market has – unusually – been in the headlines. Whether it be working practices at Sports Direct, the legal verdict on the rights of Uber drivers or journalistic stings uncovering the treatment of Amazon or Hermes delivery drivers, there has been a spike in public awareness. In part the rise in concern about the quality of work might also mirror a decline in anxiety about its overall availability due to welcome record rates of employment. Whatever the reason, the debate on the nature of contemporary work has shifted in 2016. The same cannot be said about our understanding of the types of institutions best placed to support low-wage workers in our evolving jobs market. Here there is little change. At an elevated level of economic analysis there has been a marked shift in thinking, with a range of economic organisations and commentators – from the IMF and OECD to Lord Turner (former head of the CBI) – arguing that the long-term weakening of organised labour has had a deleterious impact on the distribution of reward within the economy. But, aside from a small number of sparky contributions, this hasn’t translated into a wave of fresh thinking on the forms of labour organisation that might be suitable for our times. And if new thinking has been in short-supply there has been an absolute dearth of practical pro-labour innovation – experiments in helping bolster workers in new ways are few and far between. The argument of this paper is that this leaves a sizeable, important and largely overlooked gap which needs to be closed. It is why, as discussed below, the Resolution Trust is launching a new initiative, in partnership with others, that will develop and launch innovative civic ventures offering support to the low-wage workforce. The wider context for this is clear. A large low-paying, low-productivity service sector is a long-standing feature of the UK economy – many millions of people will spend their entire working life in it. It is unlikely to decline in size, never mind go away altogether. At the same time the membership of trade unions is heavily skewed towards better off, older, public sector workers. 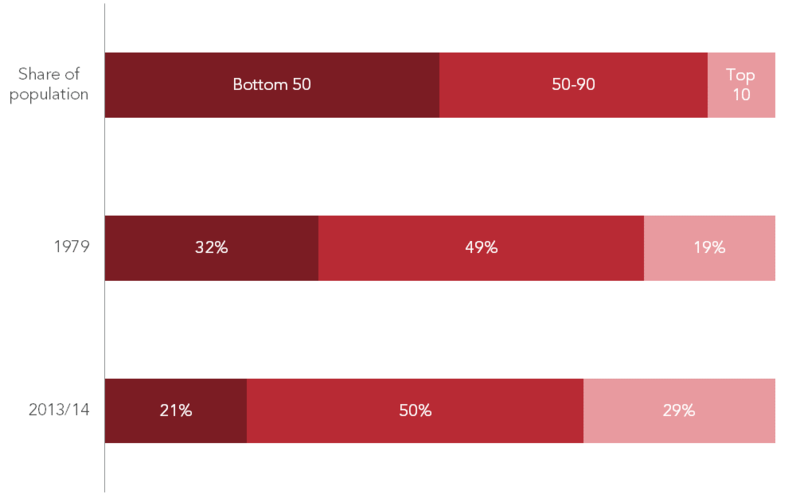 Unions are near invisible in much of the low-paying private sector and (as we show below) membership rates among today’s millennials suggest a further steep decline in the decades ahead. In some countries, existing and new institutions are seeking to close aspects of this gap. In the US, as the federal minimum wage has languished (falling back in real terms to the level it was at in the 1950s) and union membership rates have fallen to perilously low levels, a new generation of labour movement leaders have led stunningly successful civic campaigns to boost wage floors at the city and state level. This has galvanised wider thinking about how unions need to change and reach out to build support across the low-paid service sector workforce. ‘Innovate or die’ has become the mantra. There is a sense of urgency and openness to experimentation that is less visible in the UK. Many of the causes of these shifts in the nature of 21st century jobs market, and labour movement, go well beyond the scope of this paper. Our focus here is relatively narrow. First, we briefly outline a few of the challenges facing the low-wage workforce. Second, we look at what, on current trends, is likely to happen to trade union membership in the decades ahead. Third, we highlight some examples of pro-labour innovation – not least from overseas – that might be relevant to the UK in the future. Fourth, we outline the need for new sources of innovation in the UK and set out a new initiative the Resolution Trust is launching to help fill this space. Part of the context for this discussion is the long-term decline in the wage share of low to middle earners. Since 1979 the share of employment (and investment) income received by households in the bottom half of the income distribution has declined by a third, from 32 per cent to 21 per cent, as shown in Figure 1. Almost all of this fall took place between 1979 and the mid-1990s, with the share of income going to the bottom 50 per cent remaining broadly flat over the past decade. A lot of ground was lost that wasn’t subsequently made up. In part this levelling out over the last twenty years is a product of the introduction and real terms increases in the National Minimum Wage as well as the impact of a prolonged earnings squeeze since the crash – one that has had a larger effect on those towards the top of the income distribution than the bottom. With the strongest earnings growth for those at the bottom of the distribution as a result of the sharp increase in the national living wage last year, the pay data for 2016 suggests that we are not about to see a return to falling share for the bottom 50 per cent any time soon. Yet low pay is still pervasive; 5.7 million employees are classed as being in low pay (earning less than two-thirds of the median wage) and in cities like Nottingham and Sheffield almost 30 per cent of employees are paid less the (real) Living Wage. Further, none of the measures of earnings in the UK account for the self-employed, who now account for 15 per cent of the workforce and saw a 25 per cent fall in earnings after the financial crisis. It would be wrong to think that low pay provides the only, or even the main, reason why institutional innovation is needed. The nature of work has also changed in some significant ways. It is important to be careful here not to buy in to over-hyped commentary. Some who talk of insecurity imply that most, or indeed nearly all, of the workforce has been pushed into a state of precariousness. This is wide of the mark. Typical job tenure hasn’t budged in over a generation in the UK (indeed younger workers in particular are suffering from the consequences of a decline in job-mobility). The prevalence of multiple-job working is at a twenty-five year low. Similarly, fear that automation will result in the ‘end of work’ or widespread unemployment, forcing low- and mid-skilled workers to compete for an ever shrinking pool of jobs also looks – today at least – to be misplaced. There will, of course, be challenging disruption as new roles emerge and some are displaced. But the ‘hollowing out’ of the labour market in the UK has been more than matched with a ‘filling in’ of new jobs over the past 20 years. Yet none of this is to say that there isn’t intense insecurity for some. Temporary, insecure and self-employed work is on the rise and under-employment is still 40 per cent up on its early 2000s low. The rise of the ‘fissured workplace’, concerns over hours security for the under-employed, levels of pension contributions, and limited progression and training opportunities are all real issues. The numbers of workers on zero-hours contracts in their main job rose by 21 per cent in the past year to almost a million. At the same time, the so-called gig economy’s emergence is, rightly, fuelling concerns about new (or very old) forms of insecurity. It is true that so-called gig working only accounts for a very small share of overall employment. But it is growing and may well be a sign of what is to come. Add up all those on zero-hour contracts, temporary contracts with variable shift patterns and those in agency work and you find there are 4.5 million people in England and Wales in some form of insecure work according to the Citizens Advice Bureau. Roughly the same number are self-employed across the UK. Of course, this doesn’t mean that all of these types of work should be abolished: many on zero-hours contracts or in the gig economy job don’t complain of insecurity. And the clear majority of the self-employed don’t want to become an employee. Yet for a large minority it can mean low-earnings, very few rights and an absence of any institutional back-up. Improving the support on offer to these groups could be a core task for our union movement. But that is a long way from where we are today. It’s clear that the parts of the jobs market most characterised by low-paid, insecure work are the parts with the weakest forms of employee representation. This is hardly a new observation, but the trend over time is becoming more acute. Part of the story here is the wider long-term decline in trade unionism. Union membership has declined significantly from its 1979 peak of over 13 million members to 7 million in the most recent comparable data (or 6.5 million employees if we rely on the LFS) although it should be noted that the pace of decline in numbers has abated in recent years. That said, as a share of the workforce (which is the most meaningful measure) union density has continued to fall – from 32 per cent in 1995 to 28 per cent in 2007 and to just under 25 per cent in the latest statistics. But these headline figures conceal starker changes. 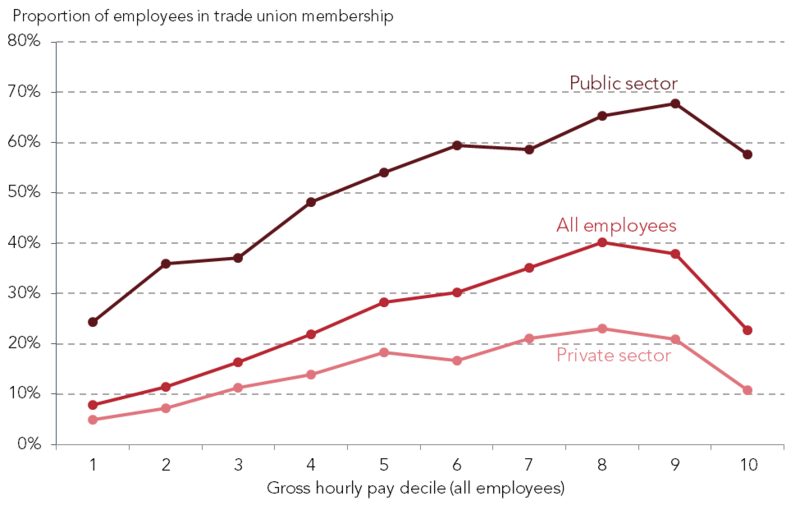 As the chart shows, union membership is heavily concentrated in the public sector, where it is 36 percentage points higher than in the private sector. The overall distribution of union membership in both public and private sectors is skewed towards higher earners. Trade union membership rises with pay from a low of 8 per cent in decile 1 to a high of 40 per cent in decile 8 – across the great majority of the pay distribution, it is true that the more you earn the more likely you are to be in a union. This pattern is even more striking if we separate out public and private sectors, as depicted in Figure 2. Over two-thirds of public sector employees in the 9th pay decile (i.e. just below the very top) are union members; if we look at the bottom of the pay distribution the equivalent number in the private sector is under 5 per cent. Unions are near invisible in the low-paid private sector: though, it is true, of course, that one factor shaping this distribution is likely to be that union membership itself generates higher pay. Nonetheless, the overall picture is that lower paid roles and sectors are simply less likely to be organised. It’s not just union membership that counts, the coverage of collective bargaining is also an important measure of union strength. And here the decline is larger still. In the 1980s, 70 per cent of workers had their wages determined collectively by 2015 that share had fallen to 28 per cent. And that figure masks the fact that 61 per cent of employees in the public sector are covered by collective bargaining compared to just 16 per cent in the private sector. To put this demise into perspective consider this: by the end of this decade more private sector workers are likely to have their pay set by the national living wage than via collective bargaining. That is a mighty reversal of the 20th century pattern. If that’s the position of trade unions today, what of the future? One way of understanding how membership rates are likely to evolve in the decades ahead is analysing changes in unionisation of different age groups over time. Here we look at all those in employment – including the self-employed. Within any given age cohort union membership rates rise as workers get older but the base from which this takes place is falling over time as fewer young people sign up. If, for instance, we look at those born in the late 1960s we see that when they reached their mid-to-late twenties over 25 per cent of them were in unions (see the start of the purple line in Figure 3). 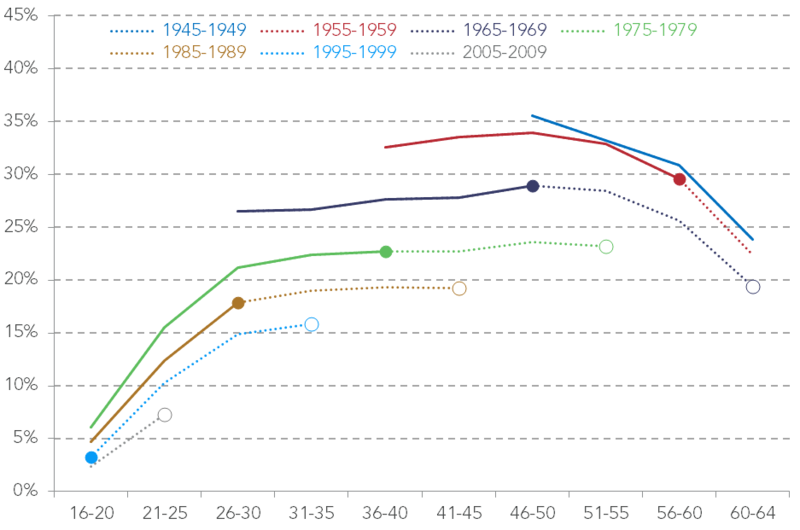 Fast forward 20 years and we see that when those born in the late 1980s reached their mid-to-late twenties only 18 per cent of them were in membership (the filled-in dot on the gold line in Figure 3). Millennials just aren’t signing up. This is a structural problem for the union movement because if fewer young workers join then it’s a reliable bet that fewer of their peers will sign-up in later life — setting in train a further wave of decline in membership figures in the decades ahead. As older workers, who came of age in the 1970s when trade unions were at their most dominant, retire and are replaced with fewer newcomers, membership rates will fall. The question is: by how much? Projecting forward to 2030 we would anticipate a further substantive decline in membership rates from 22 per cent of those in employment of working age today to 17 per cent by 2030 – a fall of a quarter in 15 years. Figure 3 sets out our analysis of trends in membership over the 20 years for which detailed membership data is available (the thick lines) and a fifteen-year projection period (the dotted lines). The filled-in dots show where membership is today and the white-filled dots show our projection for 2030. Our projections are based on the simple assumption that changes in membership in the coming years simply track the path that previous cohorts took at the same age. For example, the cohort born in the late 1980s saw a 45 per cent increase in union membership as they moved from their early to late twenties. We have assumed that the same percentage increase in membership will occur over the coming decade among those born in the late 1990s. Of course, like all future projections, ours will be wide of the mark. It may well be that our assumptions are too optimistic. Further fragmentation in the nature of work or prolonged austerity, for example, could curtail the familiar big rise in membership rates as people pass through their twenties. It’s worth re-iterating that unless union membership rises with age to the same extent it has in the recent past then our projection will be too high. Moreover, we could conjecture that shifts in underlying social attitudes across the generations – with the rise in a relatively liberal and individualist outlook, and greater scepticism of traditional collective institutions (such as the welfare state) among millennials – might well augur badly for trade unions. Against this, it is possible that we are too pessimistic. It could be argued that a greater proportion of young people spending longer in education might simply be delaying the age at which union membership rises, resulting in sharper growth among those in their late twenties in the future. However, to date this hasn’t happened. Membership rates for those in their late twenties have fallen steadily: they stand at 18 per cent among today’s 26–30 year olds compared to 21 per cent a decade ago, and 27 per cent two decades ago. And, of course, if new union drives to recruit younger workers – which the TUC are rightly focusing on – prove to be highly successful then the past will be no guide to the future. To state the obvious: we don’t know. But if our simple projections are remotely accurate then by 2030 the share of trade unionists in the overall workforce would have fallen by over a third since the turn of the century. Membership rates among private sector workers should provide the biggest wake-up call: today they are already at a miserly 13 per cent. Under our projection they fall to less than 10 per cent by 2030. To repeat: on current trends by 2030 fewer than one in ten workers in the private sector (which accounts for over 80 per cent of all employment) will be in a union. The challenges facing the UK union movement are, of course, a product of a wide range of structural factors – the slow-burn of industrial restructuring, the rise of smaller employers and self-employment, increasingly fissured workplaces (due to contracting out and sub-contracting), hostile anti-union legislation and deep cuts to public service spending, to name a few. These go well beyond the scope of this paper. However, it excuses too much to point only to these external factors. Given the demographic outlook, and the other challenges outlined in the previous paragraph, it might be anticipated that the labour movement would be seized with the importance of experimenting with new ways of organising itself – not least to attract a new and younger generation of recruits. Yet this is currently a fringe activity rather than a central pre-occupation. None of this is to decry the essential work that key unions are currently undertaking in the here and now, often in very difficult circumstances. Indeed, too many commentators on the world of work are quick to dismiss existing union achievements including in some low-wage sectors. The initiatives of a number of unions in the UK have demonstrated that the barriers to organising or representing low-paid workers aren’t insurmountable. This box outlines just a few examples from across the UK where unions are reaching into challenging parts of the labour market. (Other examples of UK unions innovating are touched on in the sections below). Perhaps the most high-profile union initiative of late has been the legal action taken by GMB against Uber, arguing that the classification of Uber’s drivers as self-employed did not reflect the true nature of the employment relationship. In October 2016, the employment tribunal ruled against the business – arguing that the drivers contesting the case should be entitled to the minimum wage and should not be seen as self-employed. This could end up having far reaching implications for employment in the gig economy and, although Uber is appealing the decision, the issue is likely to run, and run. Not least because other hearings are also in the pipeline, for example the Couriers and Logistics Branch of the Independent Workers Union of Great Britain (IWGB) has also launched an employment tribunal against four courier businesses operating in London on the same issue of worker classification. Debates around work in the gig economy are very high profile but the numbers involved remain relatively small-scale. In contrast, Usdaw – whose 438,000 members are drawn from sectors with high job churn including retail and food manufacturing – has seen an impressive 30 per cent increase in membership since the start of the 1990s. It credits this to its revamped recruitment and organising methods, including an Organising Academy that it established in 2003. It has to recruit roughly one-sixth of its overall membership each and every year just to prevent decline in the face of high membership churn, something it has successfully achieved. Hospitality and cleaning are two of the most prominent low paying sectors, and Unite is supporting campaigns for low-paid workers in both. Its London based hotel workers and cleaners branches are both growing. The former has 1,150 members across 80 London hotels and the latter has over 2,000 members. Unite has, of course, also achieved success in its campaign against working practices at Sports Direct. The high-profile campaign, played out on the front pages of national newspapers and in the select committee rooms of Parliament, has secured back pay for non-payment of the minimum wage totalling an estimated £1 million, the offer of guaranteed hours contracts to shop staff and worker representation on the company board. Our concern here is not to survey all the work of unions, or indeed the legislative and other constraints they face. It is to explore some examples – mostly from abroad, some from the UK – of pro-labour innovation that may be of wider interest. We don’t in any way claim that they – or anything like them – will remedy the strategic challenge outlined above. But we do believe that the underlying trends facing unions should make finding new ways of supporting workers far more of a priority. Technology is becoming increasingly central to the world of work in a variety of ways: from allowing management ever-increasing oversight and control of their staff to providing customers with the ability to instantly rate services and potentially temporarily bar workers from employment in the process. Its pervasiveness has all manner of benefits: it can and does drive productivity increases, reduce costs and dramatically increase quality for consumers. Tech-driven changes to the nature of work are not going to go away and nor should they. But all this hardly means it’s a purely benign force. In the gig economy at least, part of technology’s impact has been to make work a more isolated activity. This dislocation poses real challenges for those keen to pool information, share experiences and organise. Yet it also poses the obvious question: if technology can pull workers apart why can’t it also be used to re-connect them again? This is relevant to the whole economy, not just those in ‘gigging’ roles – in some respects the internet has the capacity to bring workers together like never before. It’s estimated that over three-quarters of UK adults now own a smart phone (an increase of almost 50 per cent since 2012). From care workers and supply teachers to courier cyclists and office cleaners, there is untapped potential in the opportunity that digital tech provides for enabling information pooling that could be used to help improve terms and conditions for the workforce. One example that builds on this insight is Coworker.org. The labour advocacy and petitioning website is entirely work focused (unlike websites with a similar design in the UK, for example 38degrees), enabling campaigns on any workplace related issue. In the past year alone the site has been an important part of a number of small victories for US workers, including the provision of paid parental leave at Netflix, a pay rise from $2.13 an hour to $5.15 an hour for support staff working in a small restaurant chain and changes to dress code policy in US fast food chain Jimmy John’s. Coworker isn’t just a passive aggregator of worker campaign preferences. Most of its activity is behind the scenes in finding new ways of connecting the thousands of workers who have interacted with the site with the broader union movement. It appears to have real potential – one in ten of all Starbucks employees have interacted with it. Platforms that facilitate worker campaigns and communication have been developed specifically for workers on Amazon’s Mechanical Turk (AMT) site. AMT was launched in 2005 and was the first website to offer micro-task work in return for micro-payments. These tasks are posted by ‘Requesters’ on the platform with payments as small as $0.01 for the ‘Turkers’ that carry out the tasks. Requesters, however, do not have to specify how quickly they will pay up once a task has been completed; they can withhold payment if they deem that the work carried out is not of sufficient quality. There is no dispute resolution process for when this happens; in this online market place there are few rules, and even fewer protections for workers. The lack of workplace security and bias in favour of the Requesters on the site inspired the development of wearedynamo.org, a platform on which Turkers can suggest, vote for and take action on campaigns for changes to the AMT platform. The most high profile action to come from the site was a letter writing campaign to Amazon’s CEO, Jeff Bezos, asking for better terms for Turkers. Less well publicised, but more consequential, was the collaborative development of Guidelines for Academic Requesters – reviewed and enforced by a dedicated community of Turkers. Turkers working via the AMT platform have found other ways to communicate with one another, sharing information about Requesters and tasks that are worth doing, and avoiding. For example, a worker-owned and democratically-operated online forum, mturkcrowd.com, provides a space for just this – as well as the building of a community between Turkers. Its “Daily Thread” can have thousands of posts a day and there are specific threads providing workers with help and resources to get the most out of the platform. Also, with much on-going involvement from Turkers, pro-labour researchers have developed and maintained Turkopticon to combat the information deficit inherent in the AMT platform. This is an extension that can be added to a web browser to allow Turkers to rate those offering tasks and see the ratings given by others. It has 60,000 registered users who have access to over 350,000 reviews (added to the system by their peers) of over 90 per cent of all Requesters using the website. It is a small step towards levelling the informational deficit that disadvantages workers. These examples are part of a wider trend. Sites like Glassdoor.co.uk mean that it is now possible for almost any worker, in any organisation, to review their place of work and for this review to be seen by anyone. Glassdoor doesn’t have a particular focus, but more targeted approaches are currently in development in various countries. For example, the US based migrants rights group, Centro de los Derechos del Migrante (CDM), recently developed a website – Contratados.org – to enable Mexico-based migrant workers to receive and share information as to the recruitment practices of their US employers. The site looks to fill a clear information deficit in the recruitment of migrant workers: according to CDM, 58 per cent of Mexican migrant workers have paid illegal recruitment fees. Similar technology has been introduced in New York for a different group of vulnerable workers: earlier this year the National Day Laborer Organizing Network launched a Beta version of an app – Jornalero – that enables information sharing for day labourers in the city. Those behind the Hourvoice app in the US have a larger ambition. Having just launched, but still very much in the development phase, its intention is to be the platform that low-paid hourly workers use to enter and compare details about their pay and conditions. Its developers are considering how they can use the information to support unions and other pro-labour organisations, to identify the “workplaces where workers are being mistreated and need help”. Many of these innovations stem from the US but by no means all. In Germany, the large union IG Metall has built a prototype for a similar platform, faircrowdwork.org, to gather and present information on the experiences of workers across a much larger range of gig economy platforms; a second version is under development and will be launched in March 2017. Using tech – quite often in relatively simple ways – to enable various forms of real-time information pooling amongst workers is a growth industry. Finally, there are also a number of digital initiatives that seek to encourage consumers to make choices that benefit low-paid workers. One example is fairhotel.org (developed by UNITE HERE the North American union representing hotel workers) which lists the hotels that allow their staff to join unions and organise. Those searching for a hotel that treats its workers well can use the website to support those businesses with good employment practices, and avoid the worst offenders. Improving the deal for agency workers – worker-friendly new entrants and platforms? To date, the debate in the UK around the adoption of technology in the labour movement has centred on whether online organising can actually work, and the desirability of the use of online ballots for strikes. The focus is mostly on how ‘digital’ can help boost traditional forms of organising. But the potential for technology to have a positive impact extends far beyond this. Take employment agencies. Recruitment & Employment Confederation data shows that over a fifth of employment agencies in the UK have a margin of more than 20 per cent on each placement. With over 1 million temporary workers on assignment in any given day, this raises the question as to how tech could be used to under-cut, or in some cases even fully disintermediate, existing agencies to the partial benefit of workers. Disintermediation is, of course, already happening in various ways, not least via online platforms as a method of sourcing labour. The role that an employment agency has traditionally fulfilled of screening applicants, narrowing down the list of potential hires and maybe even conducting a first round of interviews before finally putting the candidate in touch with the employer is being challenged. Websites like TaskRabbit and Upwork put candidates directly in front with employers using online rating systems and algorithms, rather than traditional labour intensive methods. But, in the UK at least, there is little work going on considering the viability of worker-friendly platforms. These might, for instance, guarantee some level of minimum payment as well as basic benefits to workers (e.g. sickness benefit to those that have carried out a minimum number of hours on the platform). To some degree this will emerge via the market as new entrants seek to distinguish themselves from competitors and attract high-calibre workers. We see signs of this, for instance, in the new app-based start-up – Flexy – who have committed to paying those they place a (real) Living Wage, and are able to do so through a combination of taking a lower fee than incumbents, finding efficient ways to match hirers and workers, and through making the case to clients that a slightly higher wage leads to more reliable and hard-working staff. But it is the exception not the norm. In the US we are seeing the emergence of other alternative ways of using tech to put workers directly in touch with customers at competitive rates. Take the Green Taxi Cooperative. With the support of the Communication Workers of America (CWA) union, 800 drivers in Denver have formed a taxi cooperative that is slowly beginning to take on Uber, Lyft and the other taxi firms in the city. The drivers formed the organisation in the summer of 2014 with the intention of taking control over their work from the platforms on which many of them relied. The process hasn’t been easy (having to overcome a series of tech, regulatory and legal hurdles) but the first drivers went to work in July of this year and the CWA hopes it will soon have one-third of the Denver taxi market. Unions in the US are also seeking to take the initiative in changing the nature of work in the cleaning industry before other platforms do so on inferior terms. The National Domestic Workers Alliance (NDWA) recently founded Fair Care Labs as the innovation arm of the union with a mission to “create effective, efficient, and sustainable solutions for low wage care workers.” It is already developing an app – Alia – to rival other gig platforms seeking to transform the world of domestic labour. Those using it will benefit from increased control over their schedule and fairer pay. With the self-employed now accounting for a record share of the UK workforce the task of finding ways of supporting those within this diverse group is more pressing than ever. New research has shown that 45 per cent of the self-employed earn less than the national living wage and that average wages among the self-employed are no higher today than they were in the mid-1990s. There are early signs of a response. The Community trade union has taken note of the recent shifts in the labour market and is seeking to become “the union for the self-employed”. Currently, 95 per cent of Community’s 27,000 members are in the private sector, 3,000 of whom are in the ‘sector’ for self-employed workers. It is the union’s priority to grow this sector significantly in the coming years. They are in talks with gig economy businesses to find ways to bring union membership to their workers and are developing a platform through which under-employed workers and businesses needing a few more hours labour can find and post work, at a minimum hourly rate of £10. The Musicians’ Union (MU) and BECTU offer encouragement to those who want to see the UK labour movement successfully reaching new audiences. The MU has 30,000 members, almost all of whom are self-employed or freelancers; as are many of BECTU’s 25,000 members. Both unions have developed a comprehensive membership package including tailored insurance products (e.g. instrument and public liability insurance). They also carry out collective bargaining on behalf of their membership, striking agreements with the big industry employers – for example the Musicians’ Union has an agreement with the BBC covering holiday pay, pensions and fee levels. For a growing number of freelancers access to flexible office space can be an issue not least as many of the co-working office spaces are out of reach financially to many of the self-employed. Interestingly, the Community union is looking into how it can develop the UK’s first trade union and cooperative partnership in this area, working with IndyCube – an office sharing cooperative. Other services are in demand too. The recently formed IWGB union (which campaigned successfully for the Living Wage and increased holiday pay for contract workers at the University of London) have formed a charity that offers legal advice and representation to self-employed workers. These are welcome moves. But the scale of activity contrasts with the situation in several other countries where unions have been representing self-employed workers for decades. America has a vibrant and growing Freelancers Union, with membership in excess of 250,000. Its Executive Director, Sarah Horowitz, is evangelical about the need to innovate: “We are starting to see unions all over the country starting to say, ‘we have to build the next era of labor organizations’. They’re not going to be perfect. They’re a first step.” It’s in this vein that the union recently announced it will be working with Uber “on how to best bring flexible benefits to independent workers in the on-demand economy”. In Holland ZZP Netherlands, a trade union specifically for self-employed workers, has over 40,000 members to whom it offers an array of services from free software to manage bill payments, to insurance and legal support. In late 2015 it launched – in collaboration with three other organisations – a national pension scheme specifically for self-employed workers (though early take-up has been limited with just 1,300 members in the scheme as of March 2016). In Sweden, Unionen has been accepting self-employed members since 1998 – also offering a large array of union services. It currently has almost 10,000 self-employed members and the self-employed are one of their fastest growing member groups. Central though trade union innovation is, some of the most important possibilities have little to do with to with the labour movement. Choices over the nature of new business ventures within the gig economy are another case in point. Some business leaders and social enterprises are taking the view that their long-term interests – in terms of reduced recruitment and training costs, higher productivity and legal certainty – will be better served if they establish digital platforms that are designed to be worker-friendly in crucial respects. To date, the examples here are generally small-scale or under development. But there are increasing numbers of gig economy “Uber-for-X” start-ups that have decided to hire staff as employees, rather than on an independent contractor basis. From Hello Alfred, a “Personal Butler” service based in New York, to Shyp, an on-demand parcel delivery service, and Trusted, a platform for booking childcare, more companies are demonstrating that the gig-economy doesn’t have to be characterised by insecurity. And Uber may soon have a new competitor in the form of Juno – a ride sharing platform in New York that, under the motto of ‘drive your future’, that is setting out to reserve 50 per cent of its shares for drivers and committed to taking just 10 per cent commission. There’s also Favor, a US version of Deliveroo, that commits to providing its ‘runners’ a minimum wage – most of the time they earn above this, but when demand is low they can be assured of a minimum hourly rate. Interesting though they are it is too soon to judge how competitive these worker-friendly business models will turn out to be compared to established firms. Cooperatively owned, tech-based start-ups are also on the rise. For example, Loconomics, a platform on which personal service providers from carers, to child minders and dog walkers can post their services without having to pay fees to a middle man for advertising and promoting their labour. Stocksy is another cooperative making its mark. A relatively new stock photo website, it is unique in that it pays photographers at least 50 per cent of sales revenue, well above the typical rate of 15 to 45 per cent that is typical in the sector and distributes 90 per cent of its profit to its photographers. These disparate cases combine to serve as a useful reminder that thinking about new ways of improving the prospects of insecure workers, especially in emerging sectors, is about much more than trade union modernisation. If we step back from the detail of these examples we see that there is a wider challenge of creating a supportive civic infrastructure around this agenda. One issue is the absence of institutions who see it as their role to help foster new pro-labour ideas and organisations. Too often innovative ideas in this field struggle to get heard, never mind get funded, tested and adopted. The links between analysts thinking about how tech is transforming work, those who advocate for workers, and sources of social investment for new civic ventures are few and far between. All of which means there is no recognised home of incubation, no shared space to develop pro-labour ideas and few sources of funding. Examples of what this infrastructure could look like are emerging. On the US west coast The Workers Lab has been established to back civic entrepreneurs with new ideas for supporting and organising those in low-wage industries. It offers finance, training and tech support to those developing ideas to help boost the bargaining power of low-wage workers. Similarly, The Worker Institute, allied to Cornell University, is another example of an organisation taking the changing nature of employment seriously. It trains members of non-traditional labour organisations and is exploring ways in which precarious workers can be better represented and supported. Another initiative is Significance Labs, which funds three month fellowships to give civic entrepreneurs the opportunity to use technology to develop products that have specific benefits for low-income Americans. The UK has no equivalents. Neither trade unions nor charitable foundations have seen it as their role to sponsor this type of capacity. In some very specific areas, for instance in the film and creative sector, successful institutions have been forged with the aim of backing a combination of employees, the self-employed and small employers in the sector. But these have a slightly different audience and are very much the exception not the norm. It is this innovation gap that has led to the forging of a new partnership – WorkerTech – between the Resolution Trust and Bethnal Green Ventures (leading ‘accelerator’ of tech-based ventures, and convenor of the Tech for Good network). Together we will select, develop and launch civic ventures using tech in innovative ways to benefit the low-wage workforce. In doing so we will draw on expertise and insights from within the tech sector, the labour movement and a number of successful social enterprises. The proposals will start small but to be selected they need to demonstrate the potential to go to scale: whether by proving themselves of worth to an established organisation such as a trade union or by providing the basis for a new and sustainable civic enterprise. The WorkerTech partnership is a first step in our wider goal of creating an institutional home for pro-worker innovation in the UK. What do these different straws in the wind mean for how we should think about efforts to build institutions better suited to meeting the needs of the UK’s changing low-paid workforce? For starters, it is striking how little pro-labour innovation is taking place in the UK. Ours is a society rich in social innovation across so many areas of our economy, public services and civic life. But when it comes to new ways of buttressing the low-wage workforce we fall short. A closely related observation is the extent to which new technology is being so overwhelmingly used to shift economic risk in one direction: from employer to worker. It’s not easy to point to tech driven shifts in the nature of work that have moved risk the other way. As we’ve seen, this needn’t necessarily be the case. A broader implication concerns the balance between legislative and voluntaristic strategies. Legislation and national policy change (not least via tax reform) could have an important part to play in supporting those in insecure work whether on zero-hours contracts or trapped in bogus self-employment. But legal rights alone won’t suffice. They need to be balanced by the hard graft of living and breathing institutions rooted in the real-world concerns of the workforce: that enable risk-sharing, tackle bad employer practice, organise training, identify new jobs, cut better deals and give political agency to collective hopes. Often these will come in the form of recognisable trade unions – but that needn’t always be the case; a dynamic array of pro-labour advocacy groups would be a good thing. All this poses a strategic challenge to the union movement. It needs not only need to work hard just to maintain itself in the here and now; it also needs to prepare for the consequences of demography which, on current trends, will see membership rates steadily but inexorably decline. Embracing purposeful institutional innovation, particularly aimed at making themselves more relevant and attractive to a new generation of workers, many of whom will have no idea what a union is, is essential. Too few unions currently show real appetite for this. But the challenge extends well beyond the labour movement. The most high-profile campaign to improve the plight of the working poor over the last decade – the Living Wage – didn’t stem from a union but from Citizens UK. Other community organising groups, such as ACORN, are also growing fast. Social enterprises like Timewise, who are successfully pushing employers to think differently about creating quality part-time work to enable career progression, are also making their mark. These examples are encouraging but they are scattered. A supportive civic infrastructure is needed to encourage more of them too. The sort of pro-labour innovations discussed in this note might feel very small scale and easy to dismiss. And, to be clear, new civic start-ups are not going to replace the absolutely essential wage bargaining role of incumbent unions in established sectors. Talk of a new uber-model of trade unionism emerging with similar clout to its industrial forebears is far-fetched. Yet those schooled in 20th century unionism would be making a grave mistake if they dismiss these new initiatives as niche and naïve or think it can all be put off and dealt with tomorrow. It’s time a range of bets were placed on new ways of supporting a new generation of workers – it should have started years ago. If the labour movement opts to play safe and stick with what it knows, it should have no illusion about what is in store. But if it embraces experimentation and tries new ways of working it might just be surprised by how receptive a new generation of workers turns out to be.